Geoff Barrow of PORTISHEAD new project Beak> play Capsule are 10! We are delighted to confirm that Geoff Barrow of PORTISHEAD fame will be joining our birthday celebrations with his latest project BEAK>. They will be performing at Vivid, an art space located in deepest darkest Digbeth. Capsule will be taking over the venue for the month of December, with a jammed packed programme of live performances, including special guests MONOTONIX, LIGHTNING BOLT, MODIFIED TOY ORCHESTRA to name but a few, workshops, an exhibition and of course plenty of cake! Beak> Iron Acton – Recording Session from Mintonfilm on Vimeo. 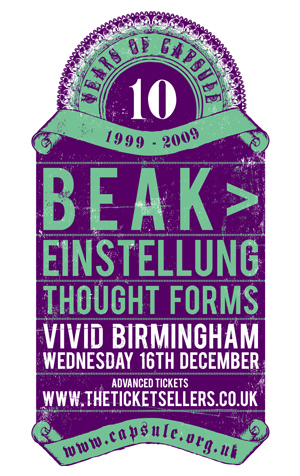 BEAK> were formed in January 2009 by three Bristol musicians, Billy Fuller, Matt Williams and Geoff Barrow. Geoff Barrow is a musician and producer best known for forming and producing music group Portishead and part owner of the independent record label Invada Records . They will be joined by EINSTELLUNG who blend glorious monotonous Krautrock with melodic tones and heavy slabs of Sabbath riffage, whilst finding time to declare sonic warfare on those tinnitus victims who have passed the point of no return. Also on the bill for this very special night are THOUGHT FORMS who made a real splash at Supersonic Festival 2009. The band take influence from luminaries Sonic Youth, Slint and My Bloody Valentine, blending their structure with inspiration from modern experimental noise bands like Boris, Double Leopards and Emeralds; It is this which gives rise to a more psychedelic sound.